Full of easy and delicious recipes for making sweets including traditional sweetshop favourites as well as modern recipes. Recipes include peppermint cream canes, peanut butter and chocolate cups, rainbow sherbet crystals, lemonade candies and jelly sweets. All the recipes are suitable for young cooks, with a little help at key stages, and no boiling sugar is involved. 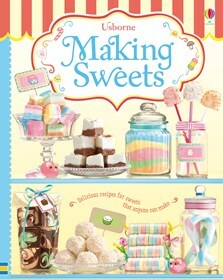 Includes templates and ideas for delightful sweet wrappers and boxes to give the sweets as gifts. Aimed at young cooks, this colourful guide features simple, step-by-step instructions... There is plenty of advice on techniques, ingredients and variations to ensure you get successful and satisfying sweets. Safe for even the smallest hands, this children’s cookbook features impressive-looking recipes such as marshmallow pops and sugar mice.